Welcome back and thanks for following! I mentioned in my first post that I’m going to be covering this past year and all of the experiences we’ve had since our wedding, so I have a lot to cover! With our one year anniversary being less than a week ago, I’ve been thinking a lot about a the fun time we had on our honeymoon, so I’ll be writing a little about that today. On our wedding night my husband and I stayed at the Tampa Marriott Waterside hotel & marina right on Tampa Bay in Florida. We had a perfect ending to our wedding day and reception; we were taken by a cute little boat (it even had “Just Married” on it!) to the hotel. It was so peaceful and romantic, and my parents didn’t even tell us about it until right before it came to pick us up. The boat brought us around the bay and we were able to relax a little from our long, but exciting day! When we arrived at our hotel and got to our room, we had an amazing view of the Bay! (see below for pictures!) I’m so grateful for my family and for all that they did for us on this special day and this was an amazing way to end it! The next morning we woke up and got breakfast nearby. I was so happy to walk around and finally say, “This is my husband! 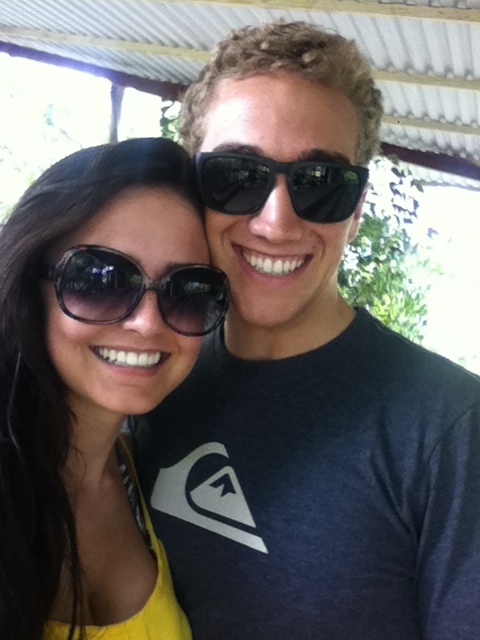 !” It’s one of the best feelings marrying your best friend and knowing that you have so many adventures ahead of you! Later that morning we went to the airport and because I left the honeymoon planning up to Michael, he decided to keep a secret and wouldn’t tell me where we were going! When we got to the gate, I was so antsy to see where we were going! I was so excited when I finally read “Punta Cana, Dominican Republic!” I had suspected we would go somewhere in the Caribbean since we were already in Florida, but I was so happy and I was still pretty surprised : ) I had never been there and I honestly did not know much about it. 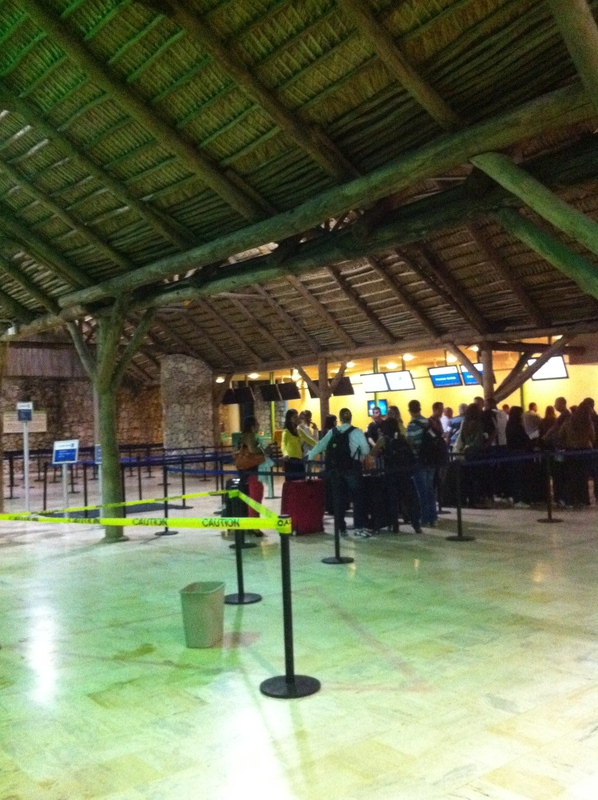 We arrived to Punta Cana late that night and the airport was literally a tikki hut! I started laughing because I couldn’t believe that it was an actual airport! One of the main ways to get around there was on scooters, and luckily we didn’t have to take a scooter from the airport to our resort, but I felt like we were going to hit a scooterist every time they’d zoom by! 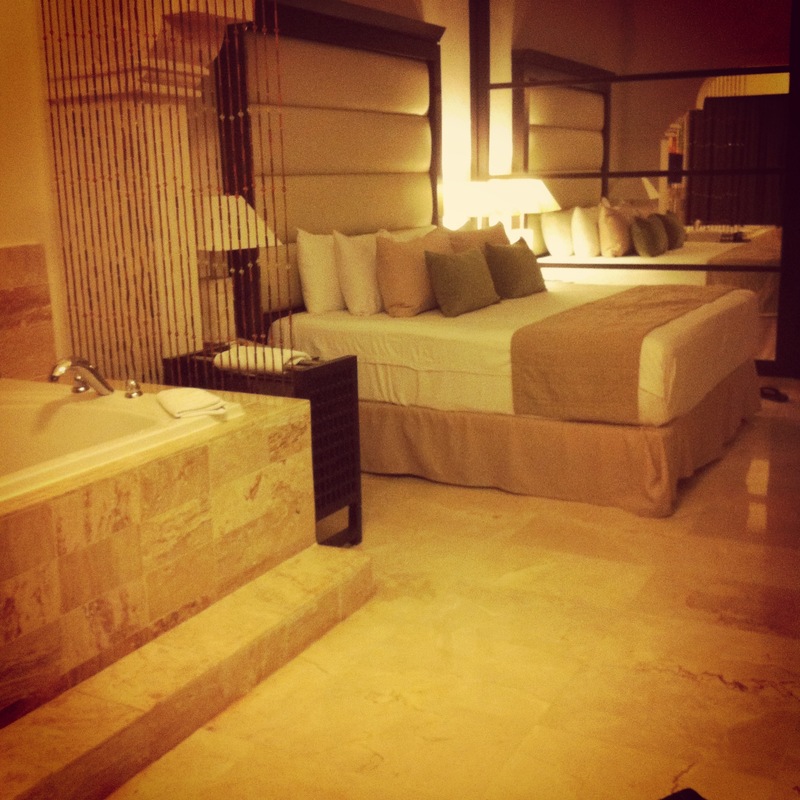 When we finally arrived at our resort ~the Melia Caribe Tropical~ they took our luggage and sent it to our room. We were given these cute little wrist bands! I loved them and thought they were a great memory and keepsake. 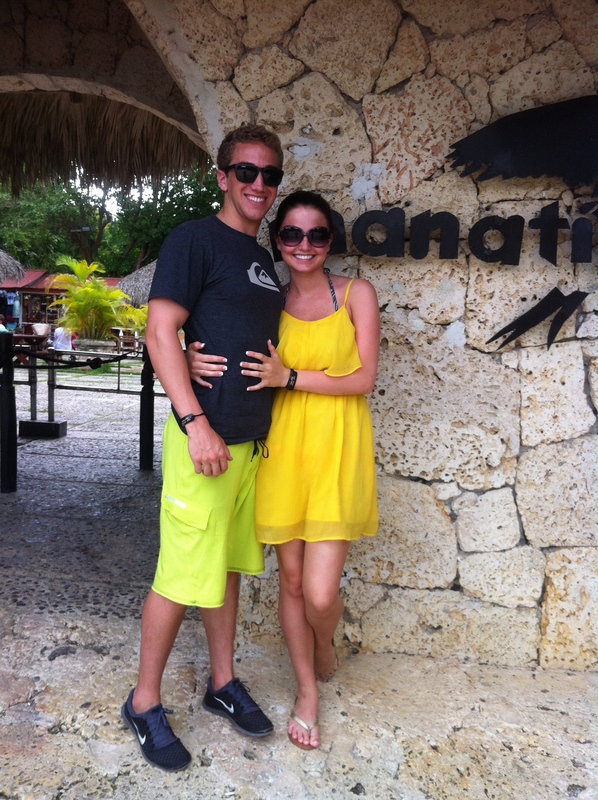 While we were staying at the resort, we were treated so well, especially when we told the staff we were honeymooners! Everything from the food to the beaches and pools were amazing! We went in the month of May, which I guess is a slower tourist season for the Dominican Republic, but it wasn’t super crowded, so I won’t complain! Michael also speaks Spanish, so he made friends with just about anyone he spoke Spanish to since they all thought it was so funny that this blonde, blue-eyed white gringo spoke Spanish! This was my first time at an All-Inclusive resort, so I was loving the staff who brought us drinks (our favorite was the virgin Pina Colada!) or snacks (plantain chips, which were amazing!) whenever we wanted, and of course the restaurants and food was really tasty too! My favorite thing was our room. 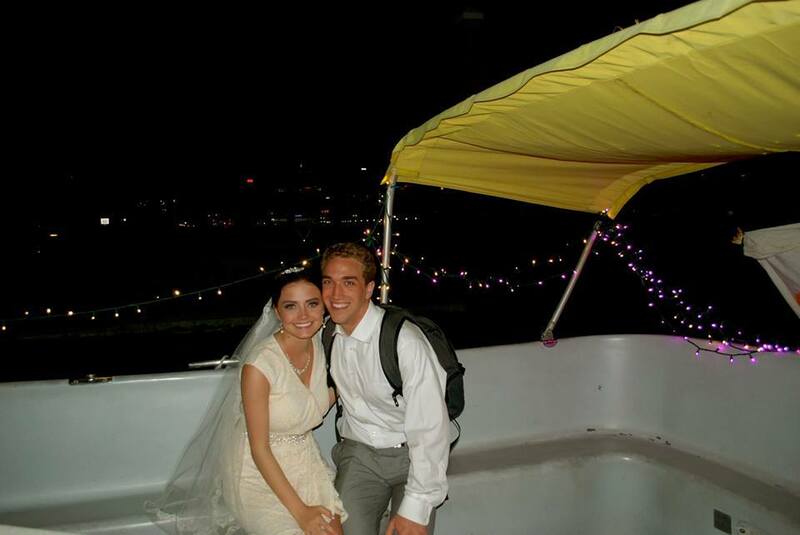 It was absolutely beautiful, and …… we had a jacuzzi in it, which was definitely a plus! We loved our Bellman, Roldan. He was assigned to us for the whole time we were there and he was so helpful and friendly! He made us reservations every night, he’d pick us up in his decked out golf cart, and he’d make sure our room was always perfect! 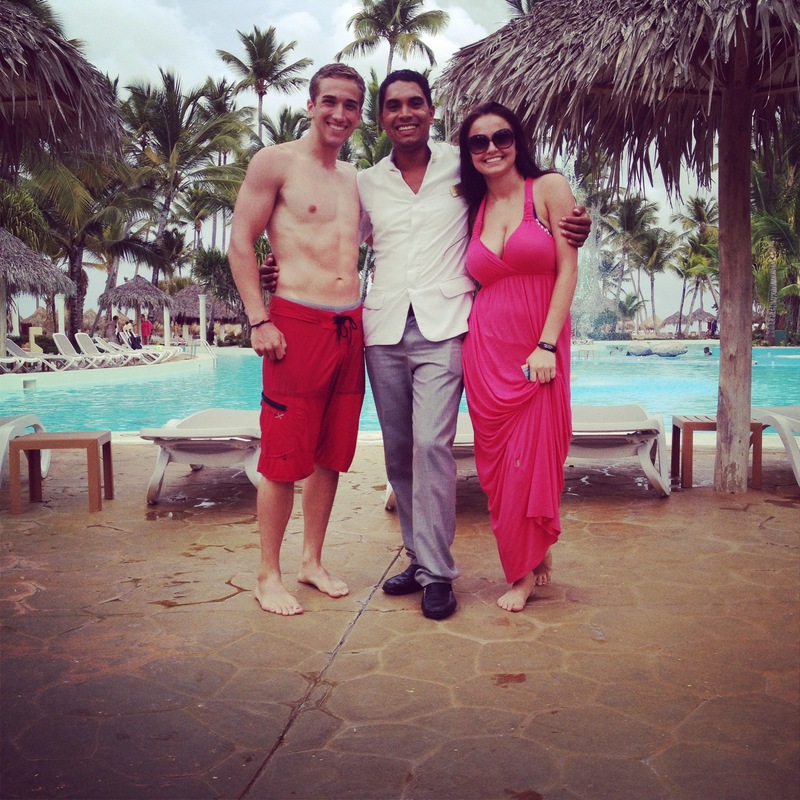 He made our experience at the resort amazing! All of the staff have amazing life stories, and it definitely made me appreciate my life and the things that I have so much more. They really are such hard workers and really appreciate even the smallest tip! We layed by the pool and out at the beach most of the days and just relaxed. The weather also cooperated the whole time we were there, which was nice since the DR can be a little stormy they told us! I mentioned before that Roldan really took care of us. 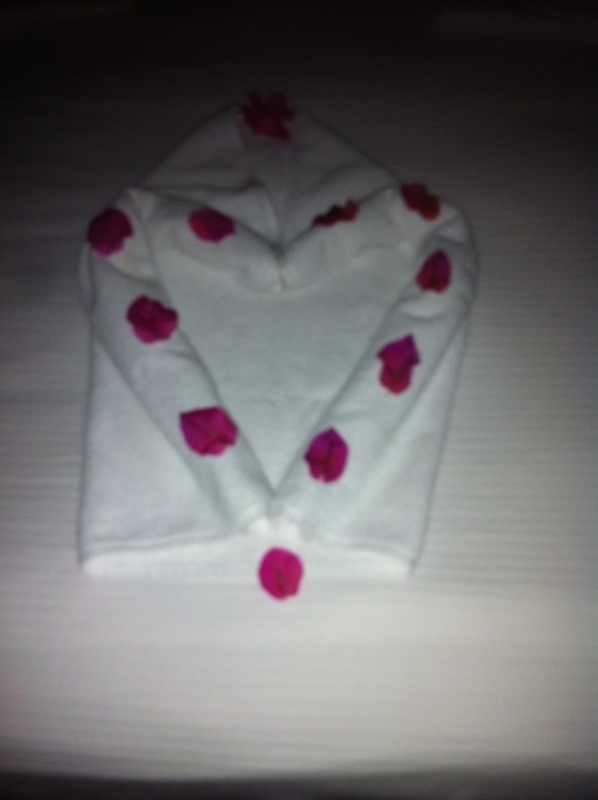 There were many nights we would come back to our room and the bath was filled with rose petals! He also always made sure our room was clean and he made our towels into cute shapes and animals. Everyone really was great though and treated us like royalty! FOOOOOOD!!! Who doesn’t love all you can eat food, every day and all day for a week? I don’t think I have ever ate so much food in my entire life. 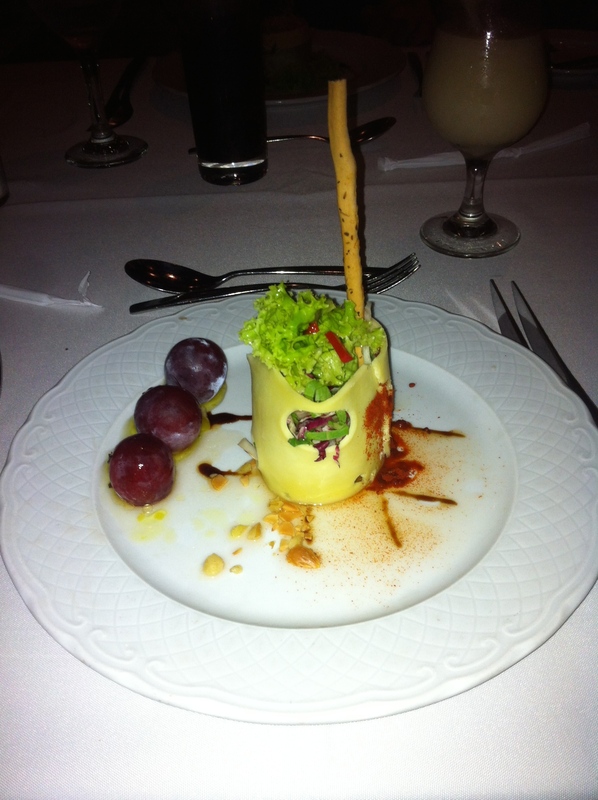 The resort had about 10 restaurants and you could order whatever you wanted! My all-time favorite day was when we went to a local ‘zoo.’ We gave in to the guys on the beach who came around offering all sorts of things and we liked this because you could swim with dolphins! I begged Michael, who thought it was really sketchy, and he eventually agreed! 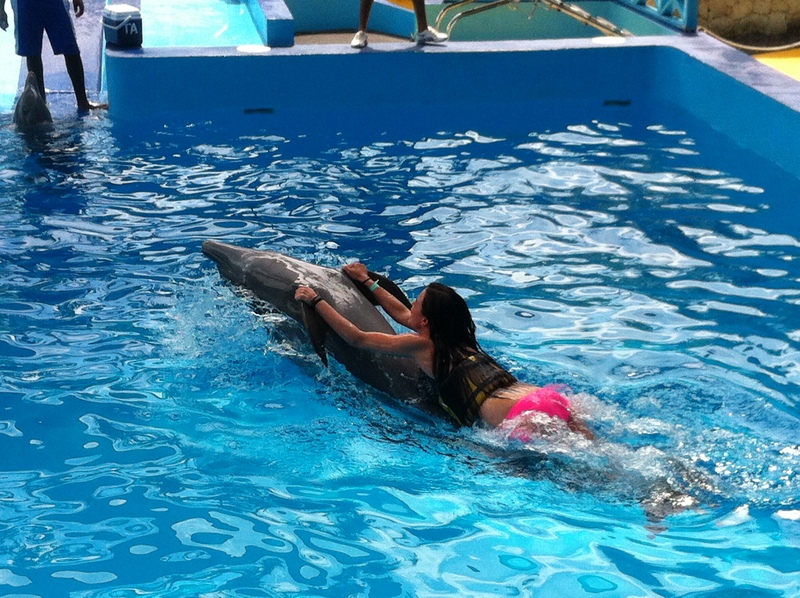 I have always loved dolphins and wanted to swim with them, so it was good to check off of my bucket list! The ‘zoo’ was a little sketchy, but it was something different than sitting on the beach or laying around by the pool, so I’m glad we did it! 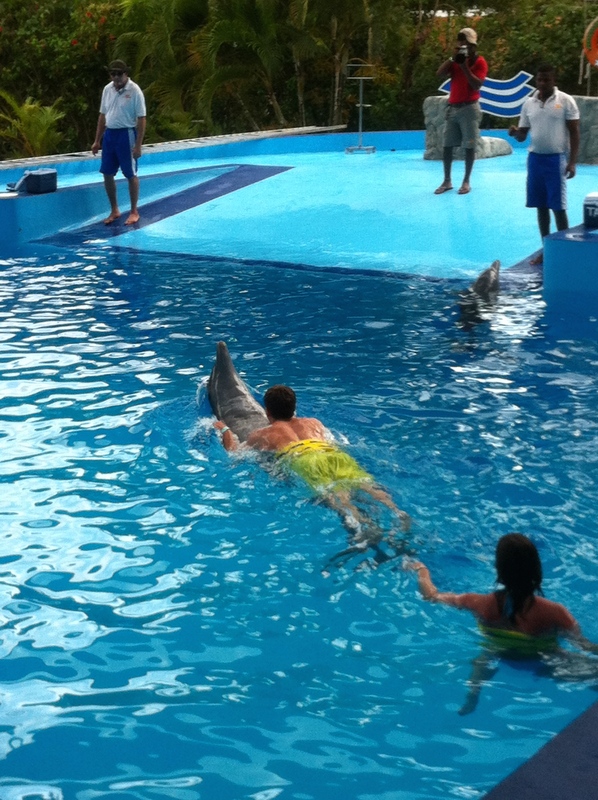 Michael and I swam at different times with the dolphins so we could take pictures (that’s why the quality isn’t great). I loved every minute of it though! Dolphins really are so smart – they had a cute little routine they did for everyone and then the dolphins would give high fives and kisses. We also got to ride one of them! The dolphin swam under us and would come up and give us a hug and when we held on to its fins, it swam really fast for the length of the pool! Overall, it was a little sketchy, and we felt kinda bad for the dolphins, but we had a really fun time and would really recommend it! Overall, we had an amazing honeymoon and made some great memories! 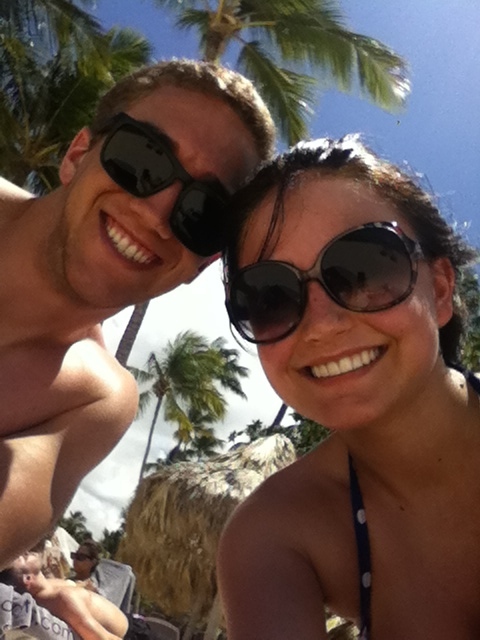 I would recommend Punta Cana to anyone, and know that you’d have a fun time! Prices were pretty reasonable as well, and it’s a fun alternative to Mexico or some of the other regular vacation hotspots. If you ever consider going there or have any questions, be sure to ask! I’d love to tell you more about our experience down there and would be more than willing to help you decide on a resort! To give you a little taste of some of the posts to come, I’ll soon be writing about flying a plane and jumping out of one, some of our California adventures, school and work, and some of my newfound hobbies and stores, so be sure to check back often! What a wonderful adventure! I may need to wander there someday! I am excited about your new blog!